We manufacture and supply highly efficient Flange Mounted Brakes that are widely appreciated for their efficiency. 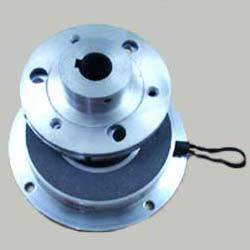 Our Flange Mounted Brakes work effectively and assures smooth functioning. Our Flange Mounted Brakes are widely used in various industries for their excellent features. We further, make them available at highly economical price. Textile machines, material handling equipments, conveyors, machine tools, glass making machines, marble cutting machines, stone polishing machines, photocopiers, packaging machines, etc. These type of brakes are normally-off type and operates on power. When power is given to the stator (coil), thearmature is attracted towards the asbestos free friction liner of the brake stator which clamps the rotatingcomponent stop at once. On switching off the electric power, the unique prestressed spring pulls the armatureplate back into its original position and brake positively released with no residual torque. Normally off type clutches operate on D.C. voltage, hence A.C. to D.C. conversion is done by means of asuitable rectifier. Switching of the brake can be on either side. However, once application demands, higherswitching frequency / faster engagement and disengagement time,switching must be carried out on D.C. Side.To restrict the high inductive voltage / back EMF a suitable supressor and capacitor network is provided acrossthe contactor coil.